Hebrews 10 was a timely read for me. I love how God’s truth is just what I need. I took a day off from work to write this study and heal. I have felt so worn lately and I’ve stretched myself too thin. That’s on me and I need to re-center and practice saying “no” more. 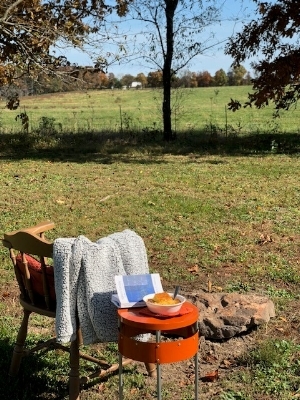 So, last Monday, I sat my chair out in the back field, warmed up a homemade bowl of chili with cornbread, studied God’s Word, and learned a few lessons from this chapter to share with you. 1 The law is only a shadow of the good things that are coming—not the realities themselves. For this reason it can never, by the same sacrifices repeated endlessly year after year, make perfect those who draw near to worship. 2 Otherwise, would they not have stopped being offered? For the worshipers would have been cleansed once for all, and would no longer have felt guilty for their sins. 3 But those sacrifices are an annual reminder of sins. 4 It is impossible for the blood of bulls and goats to take away sins. 8 First he said, “Sacrifices and offerings, burnt offerings and sin offerings you did not desire, nor were you pleased with them”—though they were offered in accordance with the law. 9 Then he said, “Here I am, I have come to do your will.” He sets aside the first to establish the second.10 And by that will, we have been made holy through the sacrifice of the body of Jesus Christ once for all. - Sometimes we need a reality check. It’s so easy to day dream about another life. You see it on FB or IG and think, “Wow, their life is so picturesque. I wish I had that.” That’s a lie. Life is messy. Life is hard. And “your hard” isn’t as hard as someone else’s, just like “my hard” isn’t either. We lose perspective in the day-to-day and then start mentally architecting an easier, cleaner, wealthier, healthier life. I know you do it, because I do it, too. Don’t get me wrong, you should capture those “cleaner” moments of life. The ones where the family is gathering around the table or you get to spend some time on a beach. Those are moments that matter, but they aren’t the essence of life itself. - I share this “reality check” with you because it’s like what the author is speaking of in this chapter. The Old Covenant was a hard life. It required repeat sacrifices, year after year, to temporarily make perfect those who drew near. However, it didn’t remove the guilt of sin because each year at Yom Kippur the Israelites were re-reminded of their sin. The Good News is, God didn’t leave us in the muck of our sin, He sent Jesus to provide us with an abundant life and He architected it Himself. - Again, the writer of Hebrews draws contrasting explanations of sacrificing animals and the sacrifice of the Lamb of God. Specifically, we’re are told: (1) Jesus’ achievement was made once and was forever; (2) It could not be repeated; (3) It doesn’t need to be repeated; (4) Jesus rested—or, “sat down”—at the right hand of God. That word “rest” has been a sacred echo for me recently. Resting in Christ Jesus. Resting in His work. Letting myself rest. - As I mentioned earlier, we can get sucked into the vortex of chaos so easily. Chaos and crazy bid for our heart daily. Stress. Bills. Tiredness. Depression. Unhealthy eating. Unhealed wounds. Oh, Jesus, have mercy on us. I have a magnet on my fridge that one of my soul sisters bought me. It quotes Hebrews 12:2 that proclaims, “Let us fix our eyes on Jesus, the author and perfecter of our faith.” That word “fix” constantly nudges me to fix, fasten, and focus on Christ. Not to focus on how I’m feeling; not to focus on my circumstances; not to focus on my tiredness. The secret to the abundant life is what you choose to fix your thoughts on and whether you believe He is able. “Lord, I believe. Help my unbelief” (Mark 9:23-25). - Friends, let’s do it! Let’s be full of belief, confident, and have a grip of faith that nothing can loosen. Let’s eagerly approach THE BIG DAY. This is what makes the less-than-perfect life on this earth worth it. Maranatha (Come, Lord Jesus)! - Several things to unpack in these final verses, so hang with me. First, we move into a staunch warning from the writer. We’ve spent a great many chapters talking about the work of Christ Jesus and establishing Him as our King and Lord. We can’t go on without the caution of sin because Satan is here to kill, steal, and destroy (John 10:10). o Sin is to trample Christ underfoot. “It is possible to stand almost any physical attack; the thing that brings submission is a broken heart.” Remember that Christ was betrayed by His very own. The people He loved deeply. Think about the person in this world you love most powerfully, and then think about an act of betrayal. That is—in a small form—what Christ feels when we choose sin. Sin is the wounding of love. o Sin is the failure to see the sacredness of sacred things. The writer wants us to fully understand what Christ has done for us. Look at the cost of what Christ did! It is sacred, and sin is the failure to realize the sacredness of that sacrifice upon the cross. - Now, we’ve discussed sin. That was tough, wasn’t it? You look at it differently now, I hope. I know I did when I read those definitions. I’ve tramped on Him, been sacrilegious, and insulted His work thousands upon thousands of times. “But God demonstrates his own love for us in this: While we were still sinners, Christ died for us” (Romans 5:8). Don’t stay in the mud beating yourself up for your sin. Let Him lift you out of the pit of destructions (Psalm 40:2) and set your feet on His rock. Keep your eyes fixed on Him. He knows you’ll mess up. He signed up for your mess before this world was created. And, He still said, “Yes!” Go give Him your best “yes” today. - These final verses remind us to not shrink back. Don’t give in. Don’t give up. Keep living the “four f’s” of life: faith, focus, fire, and finish! 38 And, “But my righteous one will live by faith. He’s coming back, friends. Amen.